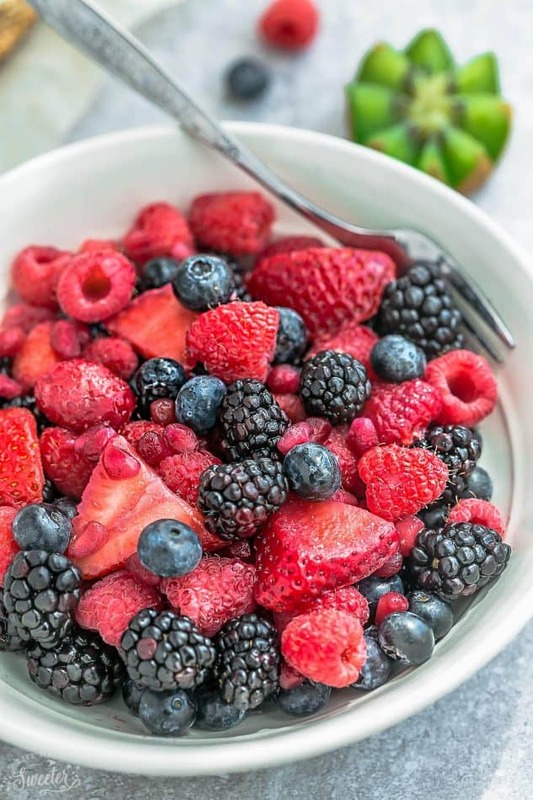 Berry Fruit Salad is the perfect easy and healthy snack. 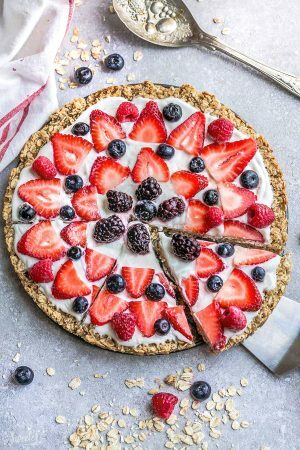 Made with triple mixed berries and a refreshing lemon and honey glaze. 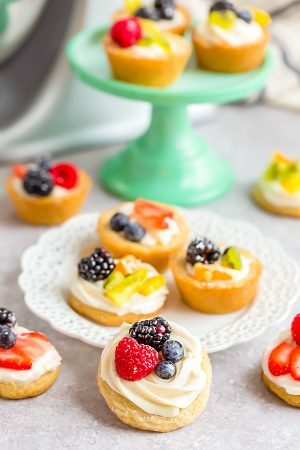 Best of all, so easy to customize with your favorite fresh fruit. It’s berry season and I couldn’t be more excited! Mixed berries of any kind are my absolute favorite. Whenever I see a carton of perfectly ripe, sweet, juicy berries at the store, I can’t help but stock up. If you’ve got an overflowing fridge full of those sweet reds, purples and blues then a fruit salad is just begging to be made. 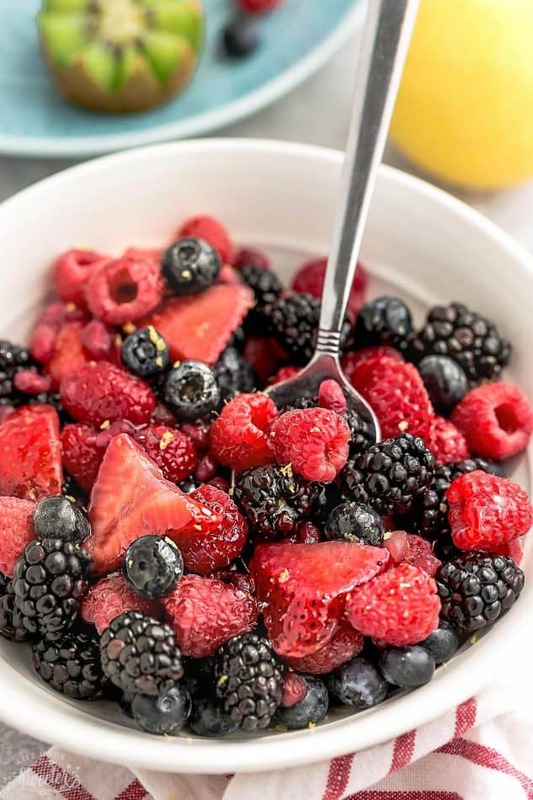 This Mixed Berry Fruit Salad is seriously the easiest sweet treat ever. And it’s healthy and full of antioxidants! First, just toss in any leftover berries you have in a big ‘ole bowl. I used a combination of sliced strawberries, raspberries, blueberries and blackberries. I couldn’t help adding a handful of pomegranate seeds as well. You can totally leave them out if you don’t have any on hand. Next, whisk together some honey (or maple syrup) and freshly squeezed lemon juice and toss that with the fruit. That’s it you guys! 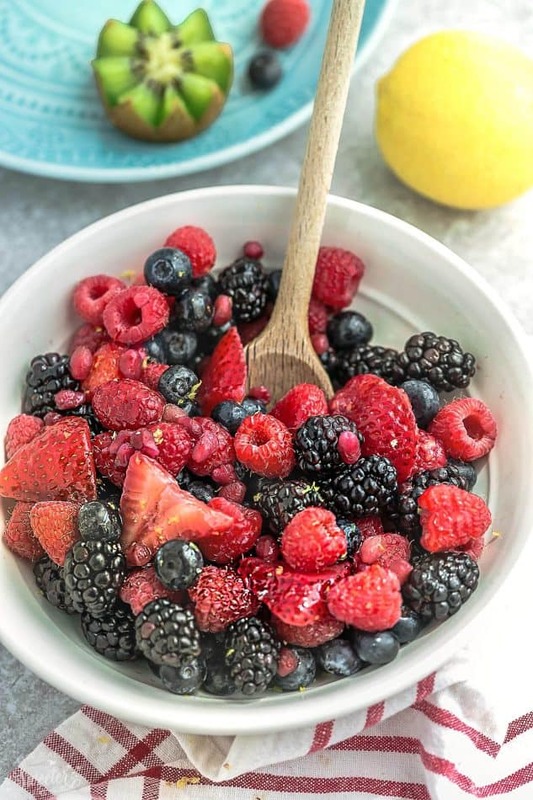 Just a few ingredients to make this yummy and fresh Mixed Berry Fruit Salad. It’s the best healthy treat to help you cool down on those hot summer days! And it’s a must for any barbecue or picnic. The red, white and blue make it just perfect for Memorial Day or the Fourth of July! 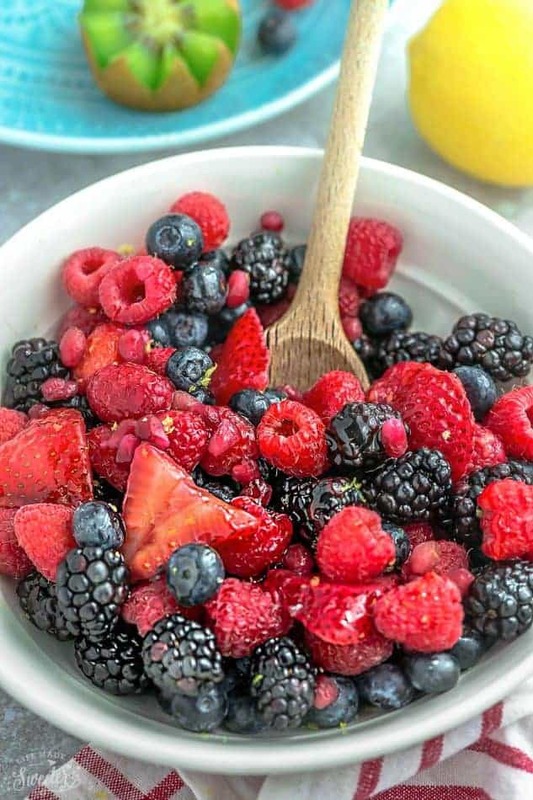 In a large bowl, toss in washed and dried strawberries, blackberries, blueberries and raspberries. In a separate small bowl, whisk together the maple syrup, lemon juice and lemon zest until combined. Pour on top of berries and gently toss until everything is evenly coated. Serve immediately, or cover and chill in the refrigerator for up to 2 days.